The address of rows and columns and the display mode can be changed by setting command. For more detail refer to SSD1351.pdf page 32~46. For example: if written A[7:6]=01b to choose 65K color mode，we use 2 8-bit data to determine a pixel in which C0~C4 represents R、B0~B5 represents G，A0~A4 represents B. 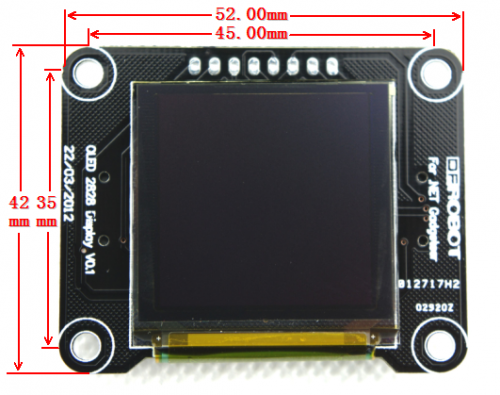 So , in depth 65k color with sequence C-B-A(RGB) mode , we can write data 0xf8,0x00 to make the screen red; and in sequence A-B-C(BGR) with same depth ,write 0x00，0x1f to make screen red. A For any questions, advice or cool ideas to share, please visit the DFRobot Forum. 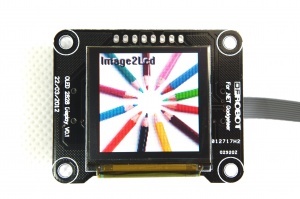 Get **OLED 2828 Display Module ** from DFRobot Store or DFRobot Distributor.